Everyone wants their Canadian border crossing to go smoothly. The best way to make sure this happens is to know what to expect and be prepared. All visitors arriving in Canada need a passport or passport equivalent, with the exception of children in certain situations. These stricter requirements were implemented under the Western Hemisphere Travel Initiative (WHTI) in 2009. Passengers should pass their passports and other ID to the driver before reaching the border services booth. In addition, take off your sunglasses, turn off radios and cell phones. Don't start doing these tasks once you've arrived at the booth. Adults traveling over the border into Canada with children who are not their own should have a written note from the parents or guardians giving permission for the children to leave the country. The permission should include the name and contact information of the parent or guardian. Even if you are with your own child but not the other parent, bringing the other parent's written permission to take the child over the border is a good idea. Whether you're wondering if you can bring a pet to Canada, how much alcohol and tobacco you're allowed, or what the restrictions are for hunting rifles and motor boats, know the rules for what you can and can't bring into Canada before you show up at the Border Officer's booth. Border officials are always on the lookout for stolen vehicles or people trying to avoid duties on vehicles purchased out of the country, so having your car registration on hand is a good idea. Unnecessary items in your trunk may be a source of questioning by border officials and may add time to your border crossing. It's a good idea to remove anything other than safety equipment and your luggage. For example, a hard hat left in your trunk may cause border guards to wonder if you are coming to Canada to work. 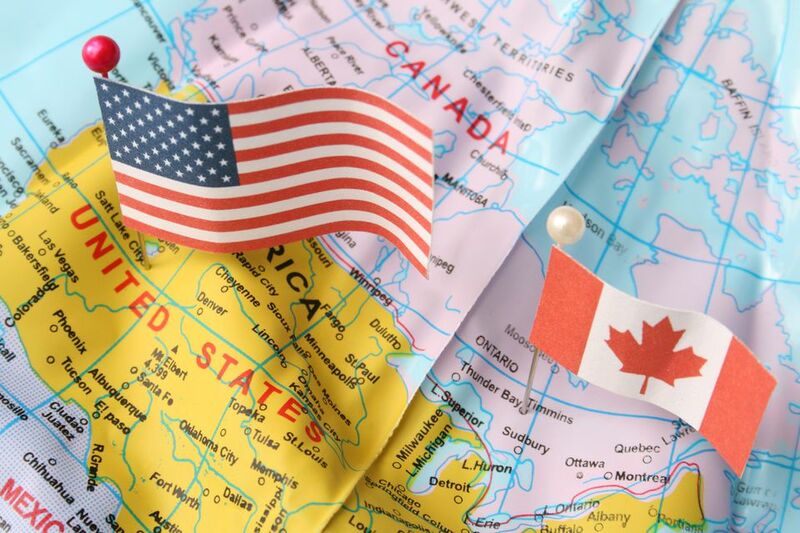 The Border Services Officer at the Canada-U.S. border will ask you a series of questions, such as "how long you will be in the country," "why are you traveling to Canada," and "what is the address of the place where you will you be staying." Answer these questions directly. This is not a time to seem unsure or crack jokes. If you've done some cross-border shopping in the U.S. or duty-free at the border, keep the receipts handy in case the border officer asks for them. Be sure to know the liquor, tobacco, and gift limits for visitors crossing the U.S.-Canada border. Many duty-free shops also have food courts and other services, but not all border crossings offer duty-free shops. Upon arriving at the Canada Border Services booth, roll down your front and back windows so that the border officer can not only speak to the driver but also address people seated in the back of the vehicle and see what's in the back seat. Before crossing the border into Canada, check out border wait times. Especially if you can choose from two or three different border crossings, such as at Niagara Falls, consult border wait times online to save travel time.